Dye the World Green: What is Saint Patrick’s Day, Really? Saint Patrick’s Day (also known as the Feast of Saint Patrick), was originally a celebration of the beginning of Christianity in Ireland but has expanded into a world-wide celebration of Irish culture. St. Patrick was born in Roman Britain in the 5th century and forced into slavery in Ireland at age 16, and set to work as a shepherd. He relied on religion to get him through the long and lonely days. Eventually he escaped and studied to become a priest, but he returned to spread Christianity to the Irish people and build churches across the country. Legend tells that St. Patrick used the three leaves of a clover (shamrock) to explain the Holy Trinity. The color originally associated with St. Patrick’s Day was blue, but over time people began to replace the blue with green (even though green was believed to be the unlucky color of the leprechauns). Although nobody is quite sure why, some people believe the change has to do with St. Patrick’s shamrocks. Others say the green was inspired by the Irish flag or Ireland’s rolling green hills. Some even say that green garb will make you invisible to the leprechauns, who would pinch you if only they could see you! After his death on March 17th, 460 AD, St. Patrick was remembered each year on March 17th by the Ireland and the Roman Catholic Church and his life celebrated with a day of feasting on traditional Irish food. In the 1800’s, the holiday began to spread with the dispersion of Irish people around the world. Celebrations of St. Patrick’s day in America grew to include annual parades with bagpipes and drums. A few Irish groups in New York pooled their resources to create one big parade, which became the New York City St. Patrick’s Day Parade, which now draws crowds of several million each year. In fact, New York was the first city to hold an official St. Patrick’s Day Parade, before even Dublin, which all but closed down each year in recognition of the holiday. 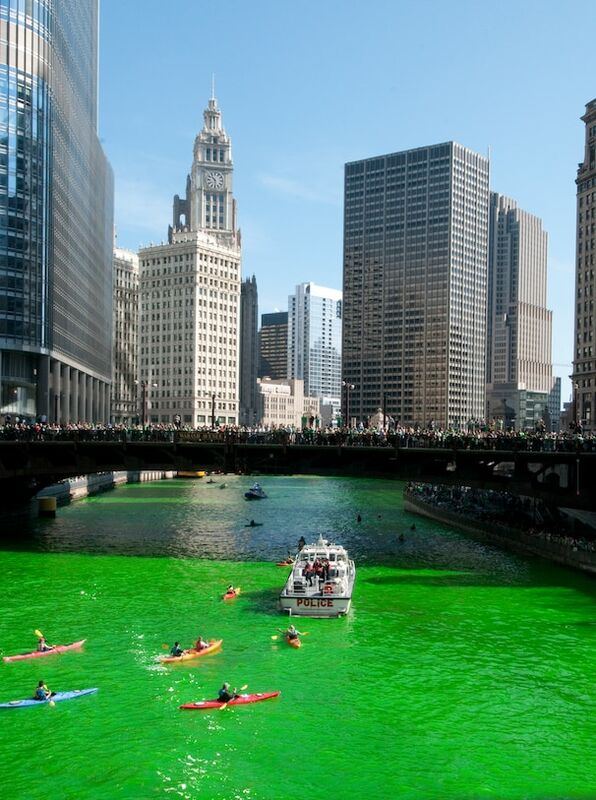 Each year in celebration of St. Patrick’s Day the Chicago River is turned green with powdered vegetable dye a tradition that was born from a much more practical purpose. Before the annual dying of the river for enjoyment, plumbers used dye to trace sources of illegal pollutants in the river. St. Patrick’s Day is now widely celebrated as a secular holiday, with many of its worldwide participants seeking to enjoy Irish culture in general instead of specifically celebrating St. Patrick’s contribution to the spread of Christianity in Ireland. Across Ireland the festival is celebrated for a few days, but the magic really happens in Dublin. Thousands of wildly dressed and colorful performers entertain crowds of natives and tourists with music, street theatre, carnivals, and parades. Food is an important part of the celebration, with many people turning to traditional Irish food, like corned beef and cabbage and soda bread. Many people now prepare green food for St. Patrick’s Day anything from green pasta, green pizza, and green eggs and ham, to green desserts and pastries. And of course, there is plenty of beer and liquor, especially in the pubs. In fact, Guinness has even tried to make St. Patrick’s Day a national holiday in the United States. St. Patrick’s Day brings out the Irish in everyone; the Irish celebrate their culture, those with an Irish heritage let it shine, and non-Irish declare themselves Irish-by-association for the day.